The hardest thing about being gluten free is having trouble finding healthy good eats when on the go. I am a very outdoors person and I am always trying to find new things to take for long days out doors. I will not spend $3 on a gluten free granola bar. This recipe is amazing. Full of protein, gluten free, low in sugar and tasty. In one bowl mix peanut butter and honey and heat in microwave for a few second to loosen. After it cools add vanilla, salt and sugar then mix well and put it aside. In a larger bowl mix oatmeal, coconut, dried fruit and crushed pecans. Return to the first bowl with peanut butter and mix in eggs well then add this liquid mix to the dry bowl and continue mixing. Finally, add the rice cereal to the mix and mix everything together well. Press mixture into a square baking well greased baking dish and cook for about 15 minutes at 350 degrees until golden brown. 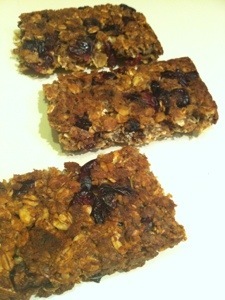 Allow to cool and then cut into bars. Enjoy!!!! I was told by a gluten free nutritionst not to ear rice crispy ceral, because it contains malt, which is on the list of things to avoid. Did I miss something? Regular rice crispy’s do have malt and are not gluten free, I actually get sick from it. But rice crispy does make a gluten free brown rice version that is great. It comes in a brown box at most grocery stores. Made these this week and they were AWESOME! We found a gluten free puffy rice cereal that worked as I couldn’t get my hand on the Rice Crispy GF Brown Rice version – yet. My husband snacks all the time and these were perfect! Just curious what you would recommend as an alternative binder to the peanut butter? Maybe almond butter for a different flavor???? 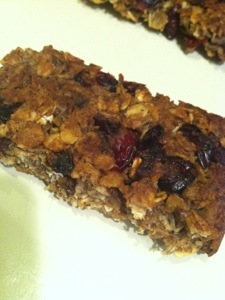 Looking forward to more granola bar type recipes!!! So quick and easy! I am happy you liked them. My site has a bunch I have created. The date bar recipe is my favorite! I’ll check them out. I have to share… GF peanut butter cookie: 1c. chunky peanut butter, 1c. Sugar, 1 egg. Mix and spoon onto baking sheet. Need to flatten a bit. 375 oven for approx. 10- 12 min. We throw in chocolate chips. Best darn cookies you can imagine!!! Had to share!